The letter R is very difficult for many French learners. * It has nothing at all in common with the English R or the Spanish R, so it’s helpful to think of it as a completely different letter. Phonetic symbol: [ʁ]. The French R is pronounced in the throat, in the same place where you say G as in "get." The difference is that the French R is fricative, meaning that you must not close your throat completely, but rather press the back of your tongue against it while pushing air through (much like you press the tip of your tongue against the roof of your mouth to pronounce Z). Previous C’est pas vrai ! 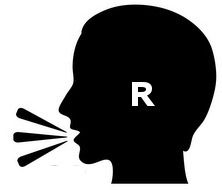 It’s not the letter r that gives non-native speakers of French problems: it’s the sound that most R’s represent. For example, no one has problems pronouncing the letter R in léger! Your explanation conflates several important distinctions. French /ʁ/ is normally a voiced sound; it is voiceless when it follows (or even precedes) a voiceless consonant (such as / p t k f s /), but this difference never differentiates words. You noted several sounds that are actually voiceless: Spanish j (and g before e and i), Russian x, German or Scottish ch. Furthermore, all these sounds are velar. French /ʁ/ is officially not a velar sound but a uvular sound. It’s a voiced uvular fricative. Umm Roo suggested ح , but that too represents either [x] or [χ] in Modern Standard Arabic — both are voiceless, but [χ] is uvular. The velar /ʀ/ occurs in many languages spoken in northern Europe. Check out the maps found in the Wikipedia article on “Guttural R” to see its extent — including S. Sweden, as Eddie Skarp pointed out. You were much closer with Modern Greek γ, but that sound is velar, not uvular. And it occurs only before / a o u /, not / e i /. Spanish actually has an allophone of /g/ that is pronounced  after a vowel, as in rogar or ruego ‘to beg’ or ‘I beg’. I had a student who asked me to pronounce Paris for her; she carefully wrote down Pagí (she meant Paguí!). I suspect that this explains the use of [ʀ] in Modern Hebrew: Yiddish has [ʀ], too. The example of Hebrew ר was not particularly helpful since that letter is “usually [r] or [ɾ], but also [ʁ] or [ʀ] in [Modern] Hebrew,” according to Wikipedia. A trill, a flap, a uvular or a velar … how could anyone go wrong? Well, with the typical American [ɹ] with its rounding before a vowel [ɹw], which the French hear simply as /w/: Paris becomes Paouis. The example you suggested for Arabic, غ, was right on! It too is a voiced uvular fricative. And to say it’s pronounced in the throat is very misleading. These sounds are produced very far back in the mouth, where the uvula is! But, like ح, it fluctuates between a velar and a uvular articulation. The idea behind listing “somewhat similar” sounds is just to give people an idea about this pronunciation since there is nothing remotely equivalent in English. It’s just a starting place, fwiw to people who speak one or more of those languages. Question–wouldn’t it be more like the Arabic خ and not غ? Not trying to be nit-picky, but I speak Arabic and there is a difference haha and I want to be able to pronounce this letter. so is the French “r” voiced? I think that the Boston (Massachusetts) “R” is very similar to the French. When I watch Questions Pour Un Champion and Julien announces “Question Art” – The word “art” sounds just like me when I say the word “our”. I am a Massachusetts native. This is a great explanation of the “r” sound as I can now hear the comparison with the Peninsular Spanish “j” and that is a revelation to me! Thanks, Laura !